The medieval Arabs took a keen interest in the study of heavens: partly because they considered the celestial bodies to be divine, partly because the dwellers of desert-regions often travelled at night, and relied upon knowledge of the constellations for guidance in their journeys. After the advent of Islam, the Muslims needed to determine the time of the prayers, the direction of the Ka’bah, and the correct orientation of the mosque, all of which helped give a religious impetus to the study of astronomy and contributed towards the belief that the heavenly bodies were influential upon terrestrial affairs as well as the human condition. The science dealing with such influences was termed astrology (Arabic: علم النجوم Ilm an-Nujūm), a discipline contained within the field of astronomy (more broadly known as علم الفلك Ilm al-Falak 'the science of formation [of the heavens]'). The principles of these studies were rooted in Arabian, Persian, Babylonian, Hellenistic and Indian traditions and both were developed by the Arabs following their establishment of a magnificent observatory and library of astronomical and astrological texts at Baghdad in the 8th century. Medieval Islamic astronomy and astronomy continued Hellenistic and Roman era traditions based on Ptolemy's Almagest. Centres of learning in medicine and astronomy/astrology were set up in Baghdad and Damascus, and the Caliph Al-Mansur of Baghdad established a major observatory and library in the city, making it the world's astronomical centre. During this time knowledge of astronomy was greatly increased, and the astrolabe was invented by Al Fazari. Many modern star names are derived from their Arabic names. Albumasur or Abu Ma'shar (805 - 885) was one of the most influential Persian astrologers. His treatise Introductorium in Astronomiam (Kitab al-Mudkhal al-Kabīr) spoke of how '"only by observing the great diversity of planetary motions can we comprehend the unnumbered varieties of change in this world". The Introductorium was one of the first books to find its way in translation through Spain and into Europe in the Middle Ages, and was highly influential in the revival of astrology and astronomy there. Muslims also combined the disciplines of medicine and astrology by linking the curative properties of herbs with specific zodiac signs and planets. Mars, for instance, was considered hot and dry and so ruled plants with a hot or pungent taste, like hellebore, tobacco or mustard. These beliefs were adopted by European herbalists like Culpeper right up until the development of modern medicine. The Muslims also developed a system called Arabic parts, by which the difference between the ascendant and each planet of the zodiac was calculated. This new position then became a 'part' of some kind. For example, the 'part of fortune' is found by taking the difference between the sun and the ascendant and adding it to the moon. If the 'part' thus calculated was in the 10th House in Libra, for instance, it suggested that money could be made from some kind of partnership. The Almagest, together with the original contributions of 9th to 10th century Islamic astronomy such as the astrolabe, was introduced to Christian Europe beginning in the 11th century, by contact with Islamic Spain. Another notable astrologer and astronomer was Qutb al-Din al Shirazi (1236–1311). He wrote critiques of Ptolemy's Almagest and produced two prominent works on astronomy: 'The Limit of Accomplishment Concerning Knowledge of the Heavens' in 1281 and 'The Royal Present' in 1284, both of which commented upon and improved on Ptolemy's work, particularly in the field of planetary motion. Al-Shirazi was also the first person to give the correct scientific explanation for the formation of a rainbow. Ulugh Beyg was a fifteenth-century Persian Sultan and also a mathematician and astronomer. He built an observatory in 1428 and produced the first original star map since Ptolemy, which corrected the position of many stars and included many new ones. Some of the principles of astrology were refuted by several medieval Muslim astronomers such as Al-Farabi (Alpharabius), Ibn al-Haytham (Alhazen), Avicenna, Abu Rayhan al-Biruni and Averroes. Their reasons for refuting astrology were often due to both scientific (the methods used by astrologers being conjectural rather than empirical) and religious (conflicts with orthodox Islamic scholars) reasons. However these refutations mainly concerned the judicial branches of astrology rather than the natural principles of it. For example, Avicenna’s refutation of astrology (in the treatise titled Resāla fī ebṭāl aḥkām al-nojūm) revealed support for its overarching principles. He stated that it was true that each planet had some influence on the earth, but his argument was the difficulty of astrologers being able to determine the exact effect of it. In essence, Avicenna did not refute astrology, but denied man’s limited capacity to be able to know the precise effects of the stars on the sublunar matter. With that, he did not refute the essential dogma of astrology, but only refuted our ability to fully understand it. "First of all, it is worth noting that the Arabs knew astronomy a long time ago. They would predict time through observing the movements of stars. According to the scholars of Shar`iah, there are two terms confused in many people's minds when it comes to dealing with the question in hand. These terms are astronomy and astrology. Astronomy is the science that deals with studying the movements of the celestial bodies and reducing observations to mathematical order. That science is useful in determining time, seasons, the direction of Prayer, etc. Astrology, on the other hand, is concerned with studying the positions and aspects of celestial bodies in the belief that they have an influence on the course of natural earthly occurrences and human affairs. Astrologists believe that the movements of stars have an influence on people's lives. 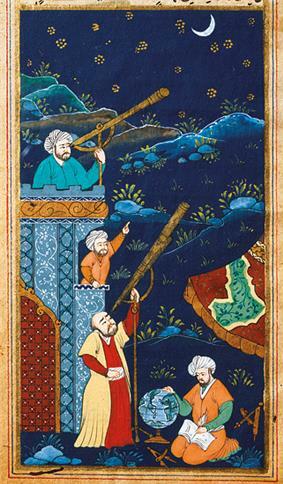 Both Muslim astronomers and [religious] scholars refuse the prophecies of astrologists." ^ a b c Wasim Aktar, Contributions of Ancient Arabian and Egyptian Scientists on Astronomy; Public Science & Reference, retrieved 19 August 2011. ^ "Introduction to Astronomy, Containing the Eight Divided Books of Abu Ma'shar Abalachus".